Describing the Goods and Services Tax (GST) bill as "revolutionary", Finance Minister Arun Jaitley on Tuesday hoped all the related bills would be passed with consensus in the current budget session of Parliament. The bill will be discussed in the Lok Sabha on Wednesday. 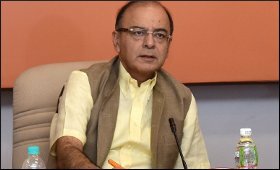 Jaitley's remarks came at the BJP parliamentary party meeting which was also attended by Prime Minister Narendra Modi and other senior ministers. "GST bill is revolutionary and I hope that its passage will be ensured in Parliament in the current Budget session," Parliamentary Affairs Minister Ananth Kumar quoted Jaitley as saying. Noting that discussions on the GST Bill will take place in the Lok Sabha on Wednesday, Ananth Kumar said that Jaitley briefed the Bharatiya Janata Party MPs about the CGST, IGST, UT GST and GST Compensation Bills introduced in the house on Tuesday and hoped that the bills would be passed in the current session through consensus. Ananth Kumar said passage of the GST Bill will benefit the people as well as economy. India moved a step closer to becoming a unified market with the tabling in Parliament on Monday of the GST Bill, which extends across India except Jammu and Kashmir. Jaitley introduced the Central Goods and Services Tax (CGST) Bill, 2017, along with three other related bills in the Lok Sabha, providing for a maximum GST rate of 40 per cent, an anti-profiteering authority and imprisonment for evading taxes. The GST regime will subsume various indirect levies of the Centre and states like service tax, excise duty, octroi and value added tax (VAT), and create an input tax credit chain for refunds. The BJP parliamentary party also congratulated Modi for setting up of new commission replacing the existing National Commission for Backward Classes (NCBC) and giving it constitutional status. The BJP-led National Democratic Alliance (NDA) approved a proposal to provide constitutional backing to the National Commission for Socially and Educationally Backward Classes (NSEBC). Apart from GST, the parliamentary party also discussed Congress leader and former Union Minister M.V. Rajasekharan's letter showering praise on the Prime Minister and former External Affairs Minister and Karnataka Chief Minister S.M. Krishna leaving the Congress to join the party.